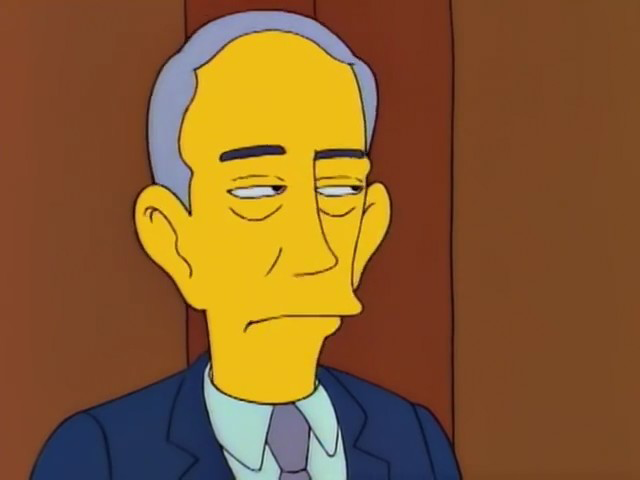 Bill Gannon is a FBI agent hired by Mr. Burns to track down Mona Simpson, along with his partner Joe Friday. He told Burns that they will track down the mystery woman, not knowing her name then. He asked a taxi driver if he had seen her and used a computer aging program to work out that she should look 25 years older. He and his partner then went to Springfield Cemetery to ask the gravedigger if he had seen her and then they go to see Patty and Selma. They then break into 742 Evergreen Terrace to catch Mona but she managed to escape in time. Bill Gannon is a character from Dragnet, played by Harry Morgan, who voiced him in this episode. Modified on April 28, 2018, at 17:43.